I must say, the kitchen transformation is (knock on wood, like my countertops) going extremely well. Having done a few projects before I know things never go 100% smoothly. So far, so good. Anything that has happened so far, like Ikea not having the sink in stock that we already cut the counters for, has been averted. Note to anybody looking at Ikea kitchen items; they are having serious distribution issues. They can't keep up with demand I'm assuming. The white double apron sink we wanted is not in stock anywhere in North America. I was told a couple weeks ago they might get some this week. This week I was told they might get 3 on Monday; And it's first come first serve baby. Those odds my friends, are seriously low. So I checked Kijiji and found someone selling one they deemed in near perfect condition for a fraction of the cost and they were super close too :) Thank God, seriously. Or someone up there who is looking out for me! So Greg picked it up yesterday, yay! It's so super humongous it's ridiculous. It's gonna be gorgeous. I also finally, finally, decided on the backsplash. I can't even tell you how many hours I've spent trying to decide. Everything else has been easy. But not this. 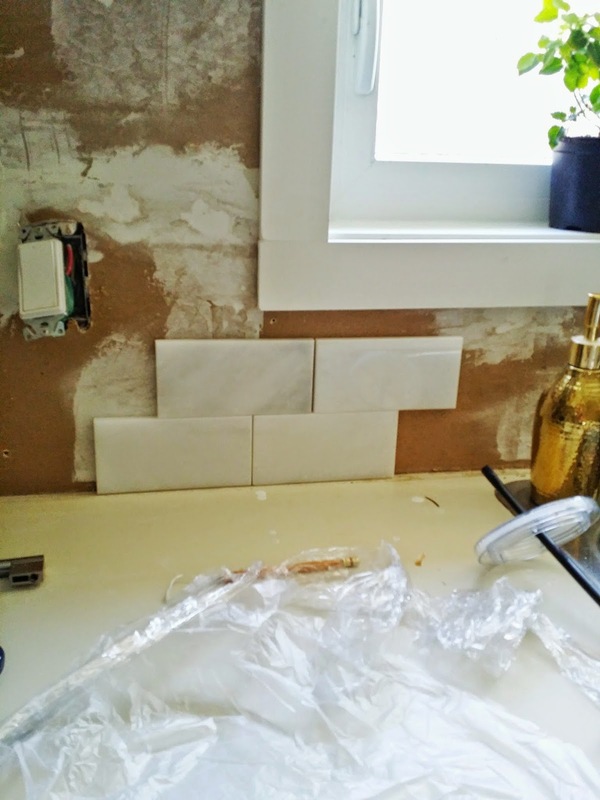 I was going to go with a classic white subway tile, which I love, but I began to doubt myself. It was bordering on perfect and boring. Argh. 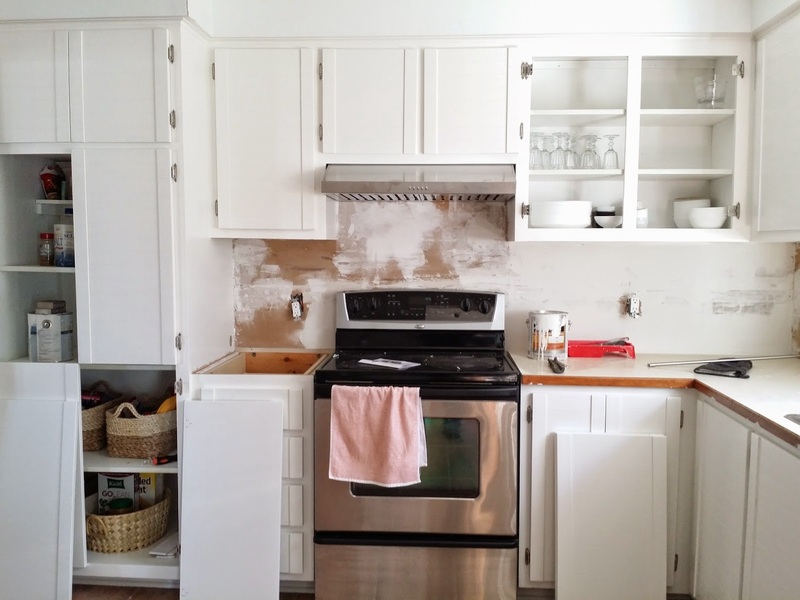 With the cabinets being white, top and bottom, I didn't want the tile to disappear. I wanted it to be subtle but still gorgeous. Timeless but still carry presence. So I decided on a marble white/gray subway tile. After bringing home many different samples, I finally knew it the moment I laid them across the wall. I love white marble with a bit of gray. I'm so excited to see it done! I'm choosing a light gray grout to pull more of the gray out of the tiles too. It'll have a nice contrast between the cabinets and wood countertops. Paint the bulkhead (not sure why it wasn't done the same time as the last coat of furniture paint, but anyway). Pick up and install the counters that we get tomorrow! Pick up the backsplash and install the handles on the cabinets. And install the sink, faucet and new dishwasher. Then it's simple fun stuff like a DIY craft for the blinds on the window and fixing up the breakfast nook and decorating. Wow, that still sounds like a lot! But Greg has taken the next 2 days off work so it (fingers crossed) should be done by sunday. I'm kinda feeling tired now. Like I'm just going to add my signature and crawl into bed tired.